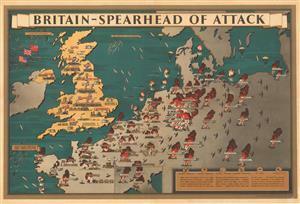 Striking pictorial propaganda map emphasising Britain's role as the spearhead of attacks against Germany and its occupied territories. Britain, coloured bright yellow, shines like a beacon compared to the sombre grey of occupied Europe. This map was published during a period of intense debate about the morality and effectiveness of bombing German cities rather than pinpointing specific military targets. The major cities of western Germany (Cologne, Dortmund, and Essen) are engulfed in a sea of flame, a particularly horrifying image. However, by using factory icons to represent those cities, the author is able to redirect the audience's attention away from the civilian casualties and back to the stated goal of crippling war industries. A rare and fascinating piece of WWII propaganda celebrating the turning of the tide in favour of the Allied powers.